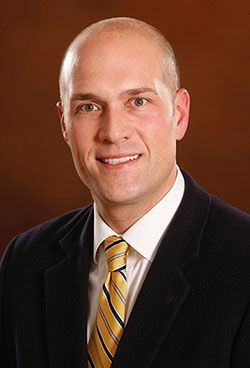 Morehead State University President Wayne D. Andrews has announced the hiring of Dr. Jason Bentley as the new vice president for student success. He will assume his new position Aug. 8. Dr. Bentley comes to MSU from Central Michigan University where he served as Office of Student Success director since January 2013. He has worked for CMU for the past 16 years and has held numerous titles. Reporting to the president, in a newly created strategic role, the vice president for student success will serve as the chief student life officer and key representative for student recruitment, student support services and student engagement outside of the academic classroom. The position will provide strategic vision to attract, retain and graduate a diverse, high quality student body. Dr. Bentley will oversee strategic analysis that shapes and ensures coordination of effective recruitment, admissions processes and retention to ensure student success. The vice president and division staff will partner with the University’s colleges to ensure that the recruitment and retention goals are aligned with institution’s strategic goals. He will develop and implement a comprehensive enrollment management and student success strategy that integrates the entire student experience from recruitment through transition to career placement. Dr. Bentley will serve as a member of the president’s cabinet and work with the senior leadership team with a clear focus on student success through academic excellence, robust co- and extra-curricular participation opportunities, strong institutional partnerships, scholarship meaningful service to the region and effective resource utilization. He will oversee the personnel, budgets, technology and operations of the following offices and supporting units: Athletics, Advising and Retention, Dean of Students, Career Services, Enrollment Services, Financial Aid, Police Department, Student Academic Success, Student Life, Tutoring and Learning Center and Recreation and Wellness. Dr. Bentley is a three-time graduate of Central Michigan University. He obtained his Bachelor of Science degree in secondary education, Master of Arts degree in educational leadership and administration and Doctor of Education degree in educational leadership. Harris Search Associates - an IIC Partners member firm, is a leading global executive search and board advisory consulting firm with 52 offices in 34 countries worldwide. Our practice is focused on identifying and attracting leaders to support the growth of clients in the areas of research, science, engineering, academic medicine and commercial enterprises. Clients include the foremost universities, research parks, institutes, academic medical centers and commercial organizations driving global innovation and discovery.